As a healthcare professional, the health of your patients is your greatest concern. At-home exercises are often a standard part of a chiropractic care plan and are increasingly being incorporated by other types of practitioners. 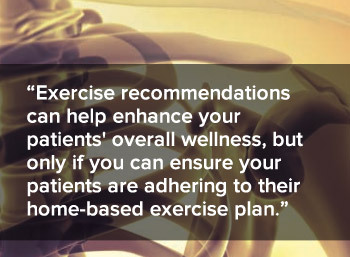 Exercise recommendations can help enhance your patients' overall wellness, but only if you can ensure your patients are adhering to their home-based exercise plan. Your patients lead busy lives and piling more onto their daily “to do” lists could be overwhelming. Only recommend 1 - 2 exercises at first, and ask them to complete them just once a day. Keep building on their plan as needed, but at a slow and steady pace. Did your patient bring a spouse or family member to their appointment? Ask them to come in and learn the exercises, as well. Your patient will have another person to go to if they've forgotten anything you've said or shown them. Their support person may also encourage and remind them about the importance of their at-home care. Do you frequently recommend products you believe to be tried-and-true? For example, are bands and exercise balls tools you recommend often? Make them available to your patients during their office visits, and show them how to use them before they leave. They won't need to make any additional stops to get the products they need and can be confident they're using your recommendations correctly. A personal phone call to your patients can go a long way. Check in to see how they feel their recovery is going and if they have any questions about their at-home care. It's a great way to show you truly care, and acts as a gentle, friendly reminder to adhere to their at-home plan. You can also e-mail or text your patients, if they've given you their consent. These few simple steps can help keep your patients on track, improve their health and give them confidence in their own self-care.